Full size 19 keys design,lightweight and compact, you can easily put the number pad into your bag and take it anywhere. Integrated ergonomic tilt provides added comfort which helps reduce wrist strain.The body is made of ABS material and the exquisite matte texture process. Feel comfortable and durable.Great for those working on spreadsheets, accounting files or financial applications. Just plug the USB cable into the USB port, no extra drivers required. Attoe USB Numeric Keypad will get connected to your computer as soon as you plug the USB cable into the USB port, plug and play, no additional drivers required. With a floating keycap design, it is not only durable, comfortable typing, but also can effectively exclude the keyboard surface water.Improve your work efficiency. Red, blue, and violet cool lights, three-color circulating or monochromatic light, emits fascinating light during dark nights.Radium-engraved character,soft light transmission. UNIVERSAL COMPATIBILITY: Works with PC, desktop computer, laptop, notebook. Compatible with Windows XP / Vista / 7 / 8 /10 and Mac OSX operating systems. WATERPROOF SPLASH: With a floating keycap design, it is not only durable, comfortable typing, but also can effectively exclude the keyboard surface water.Improve your work efficiency. COOL BREATHING LIGHT: Red, blue, and violet cool lights, three-color circulating or monochromatic light, emits fascinating light during dark nights.Radium-engraved character,soft light transmission. 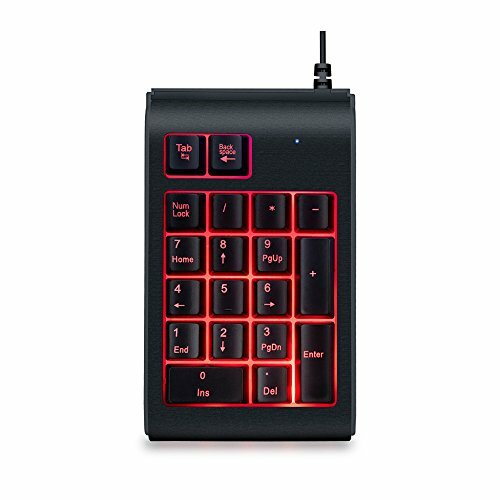 ERGONOMIC & PORTABLE DESIGN: Full size 19 keys design,lightweight and compact, you can easily put the number pad into your bag and take it anywhere. Integrated ergonomic tilt provides added comfort which helps reduce wrist strain.The body is made of ABS material and the exquisite matte texture process. Feel comfortable and durable. 100% Customer Satisfaction: 30 days money-back and 12-months guaranty, when you are not satisfied with our product or you have any question, please contact with us to get a after-sale service, we will give you a satisfied response within 12 hours. If you have any questions about this product by Attoe, contact us by completing and submitting the form below. If you are looking for a specif part number, please include it with your message.